I reviewed this Amber Sun Ale from a 22 oz bottle shaped can back in the summer. It was not very good. Actually I don’t think I finished it. But I did remember thinking that it may be an artifact of the can and that I would re-visit it if they produced the beer in a glass bottle. Well, my buddy Gene found it in a 12 oz glass bottle and gave me one. So it looks like it’s time to re-visit this one. 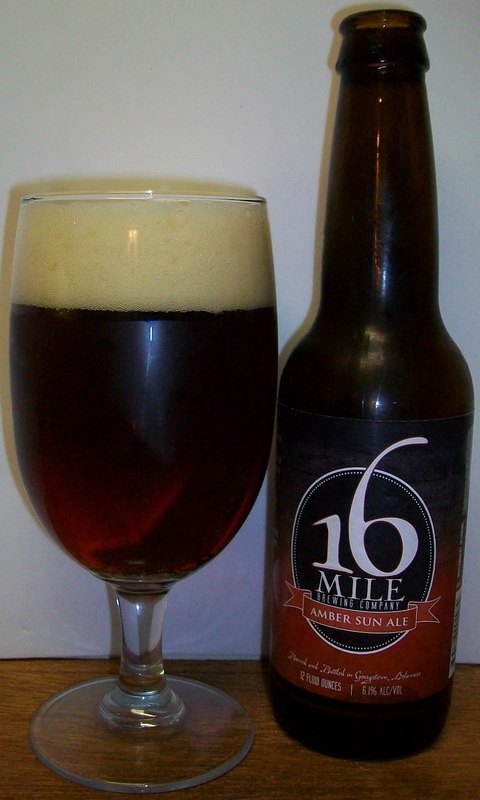 The beer pours a clear dark amber with ruby hues and a fairly rich off white to tan head. The nose is modest but nice with caramel malt and light floral hop aromas. The first sip was not bad, not impressive but not bad either. The taste starts out with a caramel malt sweetness up front followed by effervescence over the tongue in the middle of the sip. The back-end is easy drinking with an almost effortless swallow. There is also a carbonation release on the swallow that masks some flavors and adds a nice refreshing quality to the beer. The finish is pleasant with nice caramel malt flavors. There is a questionable bite at the end of the finish. I’m not really sure if it’s all hops or something else. There is not much of a final aftertaste just some slight lingering malt flavors. All and all this is not a bad tasting beer. I’m not sure how good it is but it’s not offensive. I’m going to let this warm up a little and see what happens. We are picking up some unpleasantness. There is a definite harshness on the finish and final aftertaste now. But overall this is still a drinkable beer. I think there is a noticeable improvement from what I had in the bottle/can a few months ago. I don’t think I finished that one. This is still not a great beer but at least it is a drinkable C out of a glass bottle.